As banks close their branches and try to make us use more plastic and to do our banking online, they may leave many customers unhappy and frustrated. But they also leave a legacy of some fine buildings that are of immense architectural interest and that retain their imposing presence on squares and street corners in towns and cities across these islands. 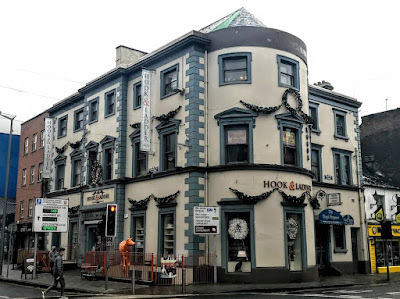 In recent weeks I have written about buildings like these on the squares, streets and corners of towns from Limerick and Listowel to Lichfield. Another fine example of this type of commercial architecture designed to make a grand statement is the former bank on the corner of Sarsfield Street and Henry Street. 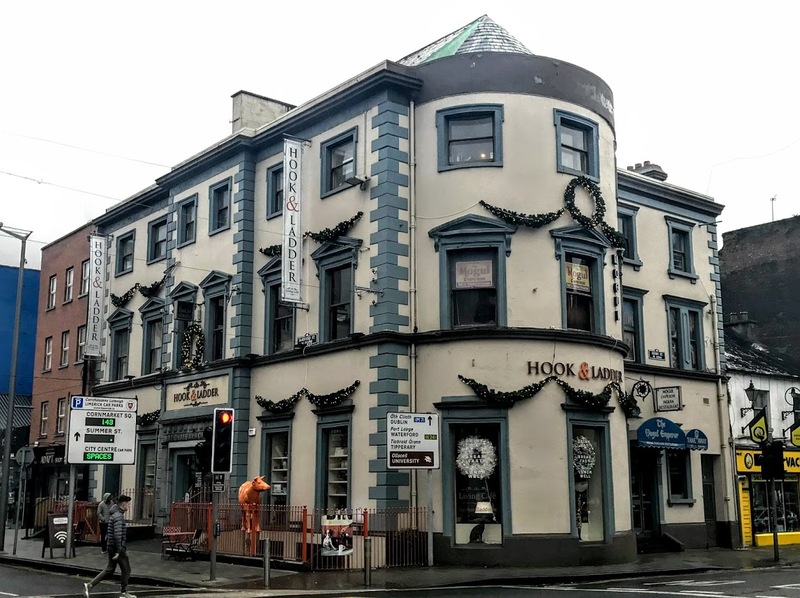 It began as the Munster Bank, later became the National Bank of Ireland, in more recent years was the Limerick branch of United Colours of Benetton, and is now Hook & Ladder. When I passed by earlier this month, it was still delightfully decorated in Christmas colours. Back in 1872, this site was marked on maps as the Munster Bank. The present building dates from around 1880 and possibly incorporates a number of earlier structures. It is a six-bay, three-storey over basement building, distinguished by a full-height two-bay entrance breakfront, a full-height three-bay bow to the north-facing side elevation, and a two-bay three-storey return facing Henry Street. There is a hipped artificial slate main roof with an eye-catching semi-conical slate roof over the bow end bay, with copper flashing lining the junction of the two. The painted ruled and lined rendered walls have stucco detailing, rusticated quoining and a parapet entablature. The windows have moulded stucco architraves, and triangular pediments and plain and shouldered entablatures. There is a centrally-placed square-headed door opening at the breakfront, and a classically inspired limestone doorcase with fluted Doric pilasters on a plinth base joined by a Doric entablature, elongated beneath the frieze to form a name plate with raised limestone lettering reading: National Bank of Ireland. The building was extensively renovated in the late 20th century, and the ground floor window sill levels were lowered to create display windows. However, the façade composition of the former bank building remains largely intact. Hook & Ladder refitted the ground floor and basement, opening the living café concept in May 2014. Today, the Hook & Ladder Living Café offers a unique experience with a variety of store concepts under one roof – café, cookery school, furniture and home accessories store. There is a wide selection of premium coffees, speciality teas and assortment of fine wines. In addition, there is unrestricted Wi-Fi, books and daily newspapers.